You will not get the first prize unless and until you try hard to win the race. The parcel will not be handed over to the recipient unless and until the recipient signs the acknowledgement. Here, in the given example, unless denotes a precondition, whereas until means till the time. Have a look at the article to understand the difference between them clearly. Meaning Unless refers to a precondition, it means except if. Until implies up to the point or time given, i.e. before that. Usage It is used to institute the only condition in which the indicated event will not occur. It is used to highlight the time that took place prior to the happening of incident. Examples You will not pass the examination, unless you study hard. We will wait for Simon, until she arrives. I do not pick calls in the office, unless it is important. Continue reading the lesson, until you get its essence. Unless you provide the required documents, the bank is not going to grant you loan. Grace is not in India, until June. You can’t get admission in Delhi university unless you have scored good grades in the higher secondary examination. No one can help you unless you tell us the problem. I can meet you on Monday unless my relatives arrive. You can go for a trip in July unless your exams are scheduled in that month. Shreya watched T.V. until 4 am. We were on a trip until Monday. It can also be used as a conjunction to associate an event with a particular point or moment in time. No one is allowed to leave the classroom until the exam was over. Sarah can’t vote until she turns 18. David stayed with us in the hospital, until my brother was discharged. The word ‘unless’ denotes a precondition to the statement given, it means except if. The word ‘until’ is used to represent a specific time, or a time limit, up to which something must happen. Unless is just a conjunction, which joins two sentences. On the other hand, until is both a conjunction and a preposition, which is not only used to join two sentences but also a preposition which is used to express the relation of the noun or pronoun with an element in the clause. Unless is used in the sentences to introduce a precondition, in which the given event is possible. Conversely, until is used to emphasize the time that occurs before the happening of the event. Goods will not be delivered unless the amount is paid in cash. Alisha would not have called Joe unless you had advised it. You should call the doctor unless she is is absolutely fine. Once Steffy starts playing badminton, she will continue until she wins. Maya didn’t sleep until 2’0 clock, waiting for his husband to arrive. The employees cannot take leave until the project is complete. 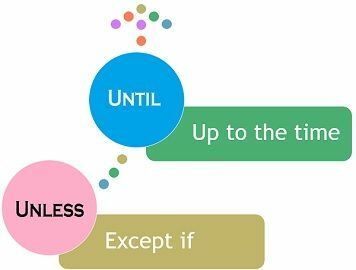 A great tip to memorize the difference between unless and until is to understand what they mean, i.e. while unless means except that, until means before that. So, in short, unless is an indicator of an exception of the given statement, whereas until sets the time limit for the event.